Now I’ll warn you, this method may take a bit of a toll on your love life and/or social life. So hopefully you have an understanding partner and forgiving friends, who would rather have you feeling your best, while potentially smelling your worst- than see you suffer through the flu. And as a mom to a toddler-tornado who gives zero effs if you are sick, I’m willing to make that sacrifice for 24-48 hours if it means I don’t have to “mom” with the flu. No gracias. 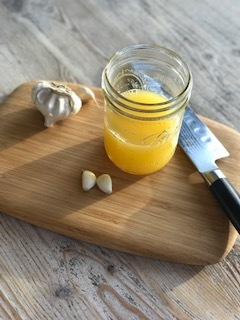 I’ve used raw garlic now to cure myself from mastitis twice while breastfeeding and more recently- fend off the flu this entire awful flu season. On three separate occasions this winter I’ve felt all the symptoms of the flu starting, used my easy recipe below and literally was already feeling better the next day. I have yet to get hit with a full blown cold or flu this winter and I fully believe it’s all thanks to garlic. The research on garlic is sound. So, this is not some old-wives tale, or magical cure your grandmother made up. There are over 5000 peer-reviewed articles evaluating garlic’s ability to fight disease and infection. It has been linked to preventing heart disease, stroke, cancer and infections- the four major causes of death. I believe the only reason you don’t hear more about it is because there is no money to be made from something you can grow in your own backyard. Why can't I just take garlic pills? There are numerous garlic supplements on the market, and while these are believed to be beneficial for maintaining overall health and preventing illness, I’ve found that they are too low dose for treating infection. When it comes to the flu, for me, its raw-chopped garlic or bust. There is a specific chemical compound found in garlic called Allicin that gives it antimicrobial, antiviral and anti-fungal properties. In order to activate this compound fully, the garlic needs to be chopped and left to sit for at least 5 minutes, 10 minutes preferably. Also, High temperatures destroy the Allicin, which is why raw garlic is significantly more potent than cooked. Again, if you want real medicinal benefits from your garlic, it needs to be chopped and raw. I recommend when cooking with garlic to also allow it to sit for 10 minutes before adding to your recipe and always try to add it at the end of cooking. This way, the Allicin is activated and uncompromised by the heat and you can reap the most benefits of this amazing food every time you use it. But again, while great for maintaining overall health- simply adding more garlic to your meals will not fight infection. 1 cup organic orange juice. Drop garlic into your cup and throw it back! Do this twice/day for 1-2 days when you start to feel sick. Or for a minimum 3 days if you’re already sick. Continue once/day for up to 5 days. Much like antibiotics, garlic in high doses has the ability to kill good bacteria along with the bad and disrupt the delicate balance in your gut. I recommend taking a probiotic along with your garlic or increasing your regular probiotic dose for 1 week as well as eating more fermented- probiotic rich foods like miso, and fermented veggies. This information is not intended to be a substitute for professional medical advice, diagnosis or treatment. Always seek the advice of your physician or other qualified health care provider with any questions you may have regarding a medical condition or treatment and before undertaking a new health care regimen.